Design Workbench is a place where design research, design education, and design practice can be more clearly understood by showing them in action. This includes commentary and observations on how design outcomes represent and impact communities of people and the challenges they face. It’s also explored through a network of sites that serve as workbenches where projects in design research and education are operated. At Design Workbench, the past and current impacts of design outcomes are explored and the future is built when designers partner and co-create with communities of people. There is much debate over the naming and positioning of design disciplines so the above list is not intended to be wholly inclusive or exclusive. One goal of Design Workbench is that designers across disciplines will work together to discover new insights into problem discovery and solving. Design Workbench exists to show design in action and how it impacts and is impacted by people. In order to show design in action, contributors are invited to post different types of content to the network of sites. Photo observations can be added to the Design Workbench by tagging Instagram photos with the #wkbnch hashtag (user accounts can not be set to “private” when posting photo observations via Instagram). These posts should be quick insights or comments that show design as its happening. Each insight will become a post on the site and can be discussed via comments. If an Instagram photo or video has a location enabled, a map will also show up on the Instagram photo page on this site. Text-based posts and observations of design outcomes in use, stories of design education projects, and insights into daily design practice are welcomed. If you are interested in writing a post for the main Design Workbench site, contact us to get an account so you can post your ideas as a contributor. The more voices that are shared, the more rich the discussion can be. Thinking, insights, and observation are welcomed on Twitter by using #wkbnch as a hashtag so all can share in the conversation. A shared Pinterest Workbench board is open to those who would like to collaborate and share pinned content. Contact us through Pinterest to become a collaborator on the board. Visit our Pinterest feed page to get a feel for the types of content contributors are currently posting. Individual projects can be operated on through standalone workbench sites in the Design Workbench network. Operators of each site will be given access to a variety of tools for engaging participants, gathering data, and reporting results. Each project should involve people and design, whether it be through research, exploring education, or in practice. If you are interested in securing a Design Workbench site or have questions, please contact us. Design research students work on a water conservation problem. The site is open to collaboration from anyone who is a design researcher, design educator, or design practitioner, regardless of your corporate or institutional affiliation. Communities, municipalities, businesses, and individuals are invited to participate in discussions and to explore the knowledge being shared here. If you have an idea or need for a project or would like to participate in a design research or education project, please contact us and we’ll make those connections. Design Workbench’s goals and features were inspired by presentations, and discussions that took place at three design educators conferences held in 2014. Connecting Dots, an AIGA (American Institute of Graphic Designers) Design Educators Community conference was hosted in Cincinnati, Ohio in March and focused on making connections between design research, education, and practice. Pica 2014, a GDC (Graphic Designers of Canada) conference that took place in May in Edmonton, Alberta, Canada focused on pioneering the future of design. New Ventures: Intersections in Design Education was hosted in Portland, Oregon in September and invited discussions on design education’s reach, application, and evolution. Design Workbench exists to make connections and intersections more tangible by showing them in action as an extension of the conversations that started at each conference. The first version of Design Workbench. 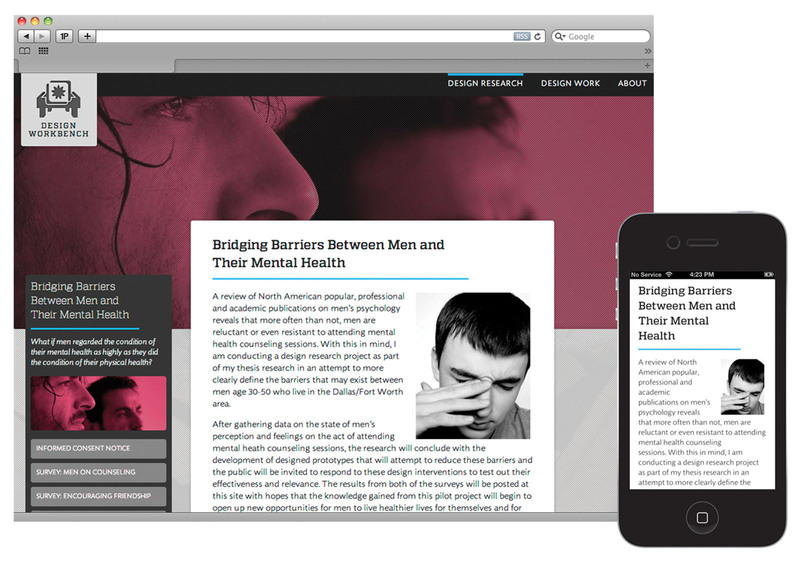 This site first launched in early 2013 as a tool developed to support research projects in the Applied Design Research MFA program at the University of North Texas. Design Workbench was designed, developed, and is operated by Dennis Cheatham who is an Assistant Professor of Graphic Design and an Armstrong Interactive Media Studies Affiliate at Miami University in Oxofrd, Ohio. The Design Workbench network is supported by the xD:MFA Experience Design program in the College of Creative Arts at Miami University.